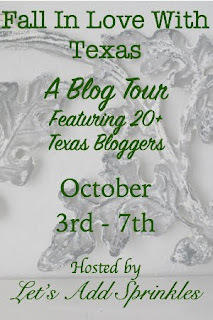 I'm delighted that you have stopped by on Day 3 of the Fall in Love with Texas Blog Hop! until, at last, they came to an oasis? Suddenly, everything was perfect. That's how fall feels to me after four really hot months in Texas. When I ordered this "hello FALL" pillow from T.J. Maxx this summer, the temperature outside was stuck in the nineties. The pillow arrived in just a few days. At first, I intended to put it away for a while. Instead, I decided to tuck it in a corner by the fireplace as a little tease of the cooler days ahead. Thank goodness, autumn has now arrived here for real. Bring on the pumpkins! This is the area off of our family room that I like to call the "sunroom." 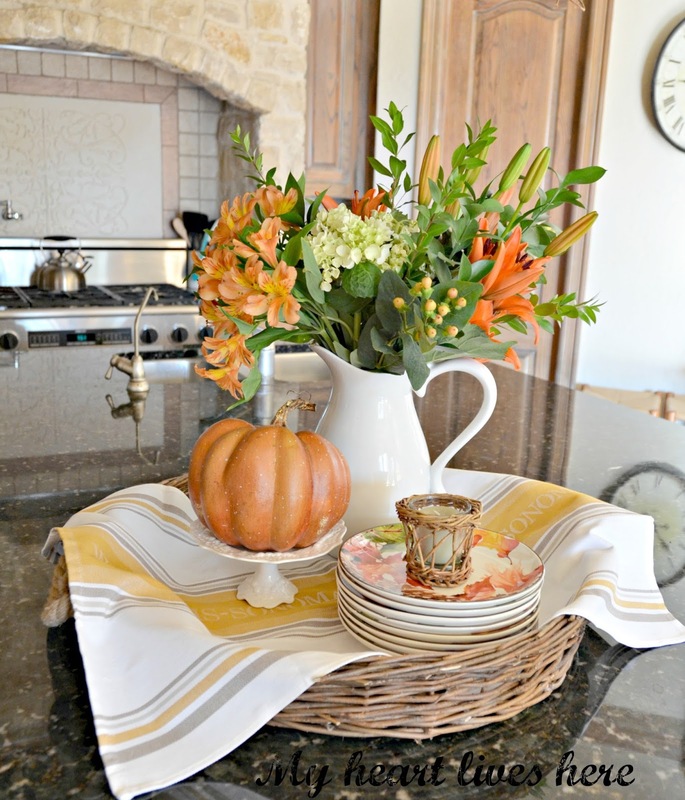 Fall also brings a few small changes in the basket on the kitchen island. 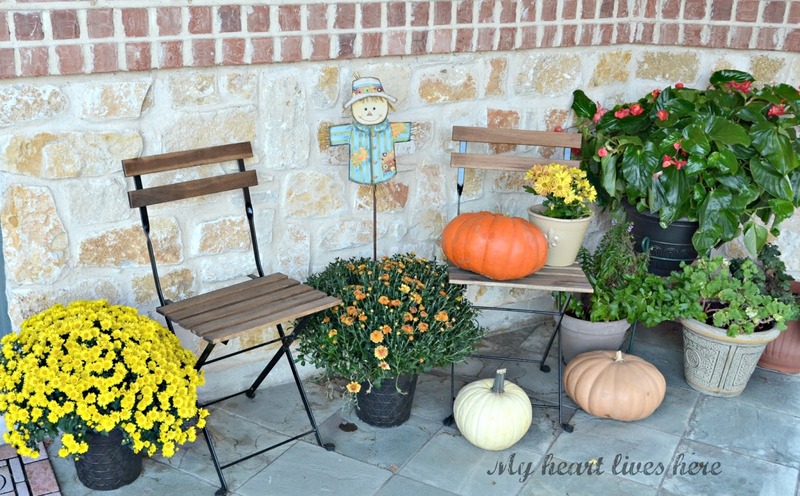 I shared this fall table in a recent post. And of course there are some pumpkins outside, too. 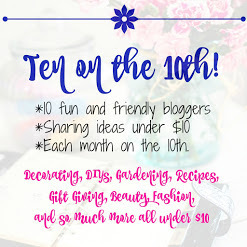 Be sure to visit all the other bloggers on the tour this week! Thank you so much, Stacey. Getting ready for this tour has been a welcome distraction since I've been home so much. Beautiful home Eilis. 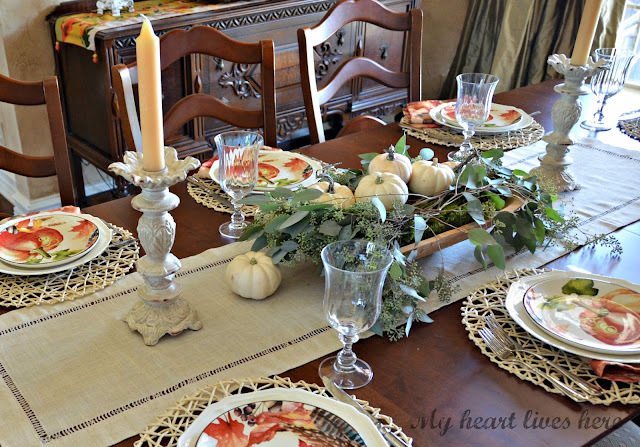 Just LOVE your table setting with the pumpkin plates and that beautiful centerpiece. Need me some Baby Boos. Thank you, Audrey! The little guys are irresistible, aren't they? Thank you, BJ. I love visiting so many friends' homes! It looks fabulous. I just love the white pumpkins in your dish dresser. I love the pumpkin pillow. It's my favorite image. It looks so cozy. Thanks for being a stop on our tour. Thank YOU so much for putting the tour together, Katie. I'm enjoying it. I love your sunroom, the hutch and oh the brick walls! Your home is positively gorgeous, every room is filled with glorious detail and decorating style. These pillows are positively perfect, I think your invitation to Fall worked! Thank you, Jemma. I may put the pillow out in July next year! Eilis, I love all your white dishes and pumpkins. 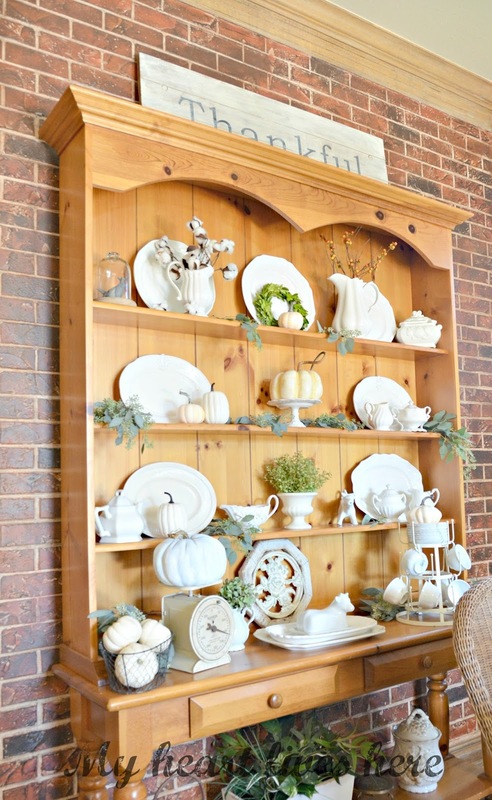 That hutch with all the white fall accessories is wonderful. You much enjoy being out in the sunroom in any season. Thanks for sharing on the Blog Tour. Thank you, Carol. Yes, the sunroom is a fun area to decorate each season. Everything looks so perfectly Fall-ish, Eilis! I love your pillows, your table, your scale with the pumpkin, your kitchen tray, and your sugar mold with the mini pumpkins (I have one of those, too, and I'm going to copy your idea!). Thank you for sharing your heart and home with us. Hi Kitty! Copy away. I copied it from a darling little store. I already had the mold, but bought the cute little faux pumpkins there. Eilis, it looks like a magazine. Such prefect touches here and there added to your beautiful home. 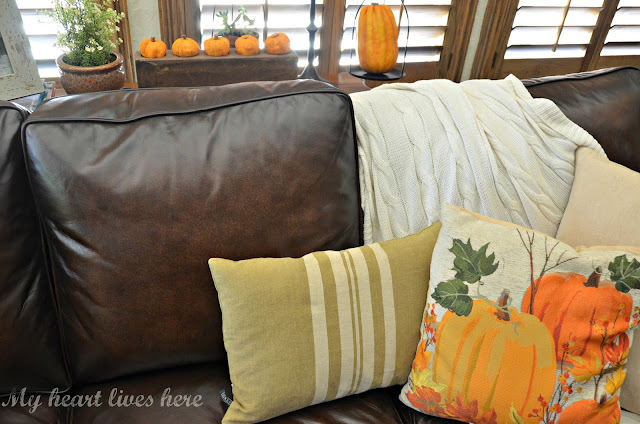 Love the fall pillow. And the hutch and I could keep going on and on, but will just say thanks for a great tour! Eilis you are the master of vignettes! 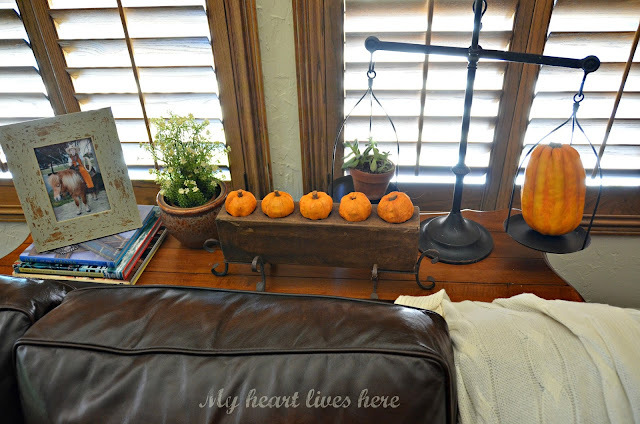 I adore your autumnal touches throughout your home ~ particularly your hearth. Thank you for visiting. You are too kind! Let's hope the magic lasts a while! Thank you for visiting. I love your home and I need that pine hutch! I love that hutch, too. It was perfect in breakfast room two houses ago. I stored it in my craft room in the last house, since there was no wall for it. I turned the "card room" of this house into my "sunroom" as an excuse to display it again. It is so fun to decorate. Thank you, Celestina Marie. I'd love to have you come back soon! 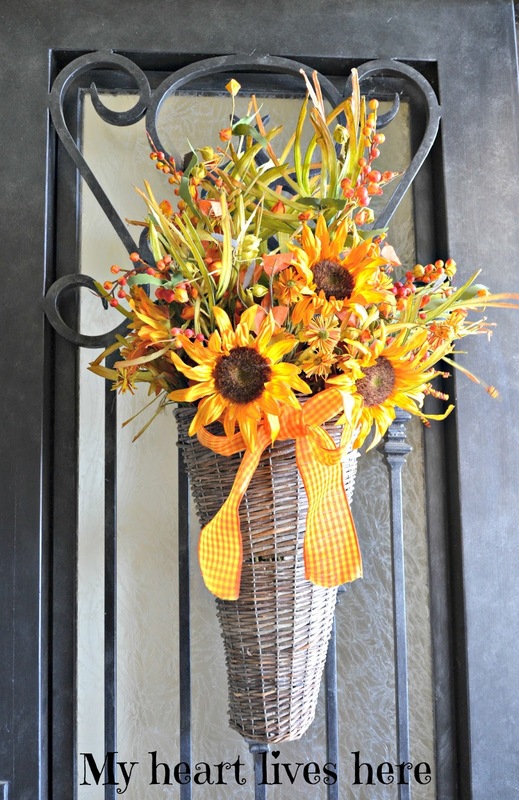 You have a lovely home and it looks beautiful decorated for fall! Thank you for stopping by, Penny! 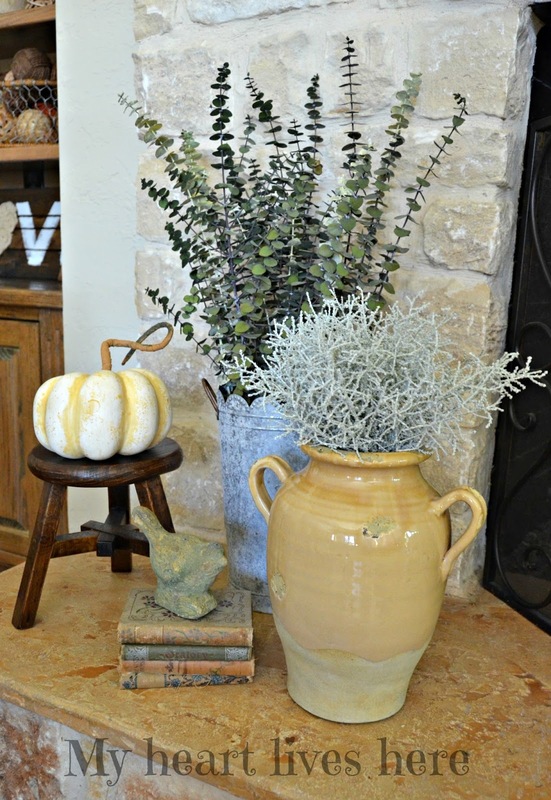 Such pretty fall touches throughout your home. I love your hutch with all the white! You did a great job. Let's hope we stay cool and that the temps prove to us Texas gals that Fall is really here to stay. Thank you so much. I guess fall in Texas is more a state of mind than an absolute guarantee of cool weather! 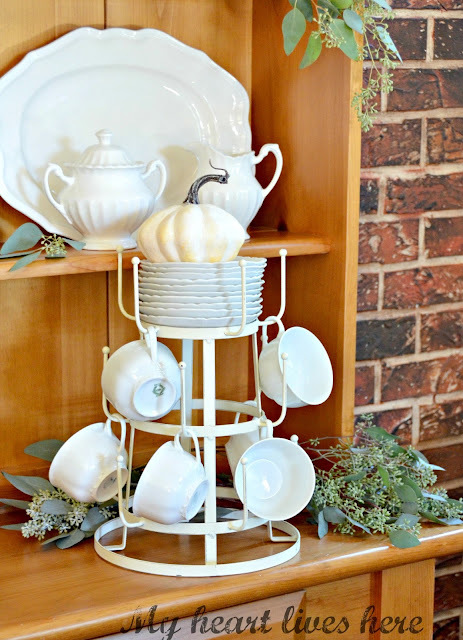 You kept your Fall decor simple and classic - I love it! Beautifully decorated with style. Love your hutch with the fabulous collection of white dishware. A pleasure to visit and view fall in your home. Eilis, your home looks beautiful decorated for Fall! I love all of the gorgeous color! I so enjoyed the tour! Happy Fall!!! Thank you, Cecilia. I enjoy decorating it. 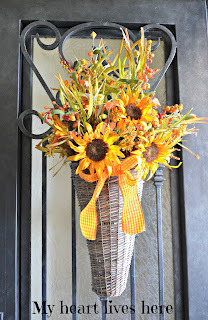 I love your pretty Fall decor, Eilis! I like the mini pumpkins in the sugar mold - mine is holding paint brushes -ha! And your lovely pillows are perfection! Now for the next cool front to come roaring through to cool us off again! Last week was such a tease! 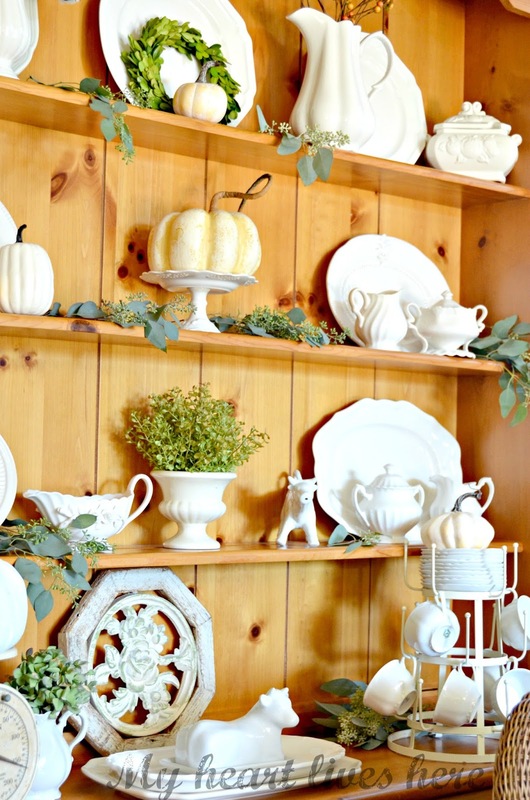 The hutch full of white ironstone and the touches of eucalyptus and baby boo pumpkins is most attractive. 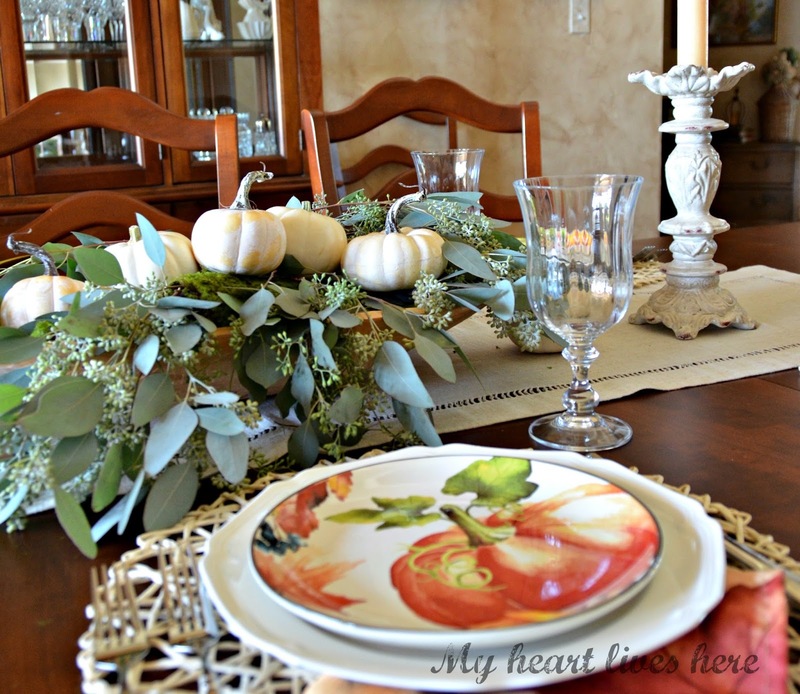 Beautiful styling and your tablescape is as well. Thanks for sharing. Happy Fall! Your home looks just lovely, Ellis. I love your Welsh cupboard filled with white ironstone! Thanks for sharing. Thanks for stopping by, Vickie. You have a beautiful arrangement on your kitchen island. Your kitchen has such a wonderful French Country design. In the background of the island, I see a gorgeous whitewashed/limed wooden door with an arched raised panel. Your range in the arched stone alcove also caught my eye. 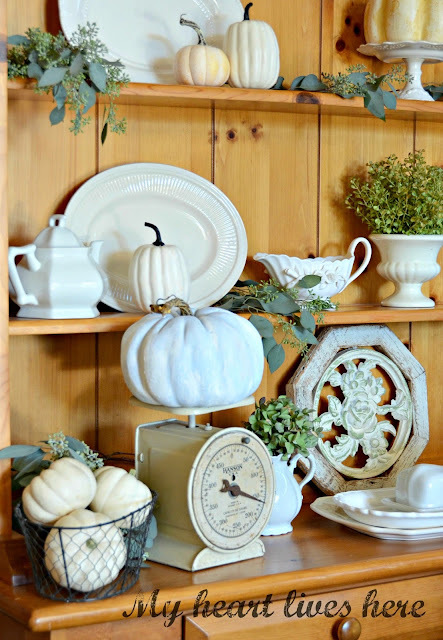 Your white stoneware paired with the white pumpkins is the perfect backdrop for your freshly painted blue pumpkin. 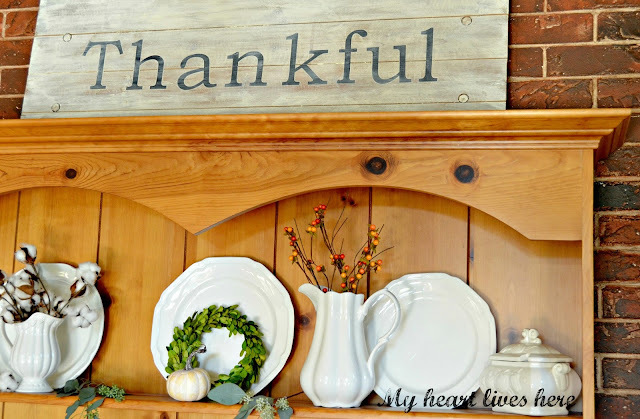 Well it's all just beautiful from your fall pillow to your cabinet filled with white dishes! I agree, bring on the pumpkins!! Thanks for sharing with SYC. Found you on Your Inspired Design. I wish I could follow along behind you with my camera! Beautiful post! 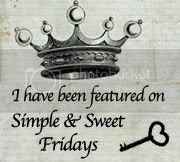 I just discovered your blog through Feathered Nest Friday and what a beautiful home you have! 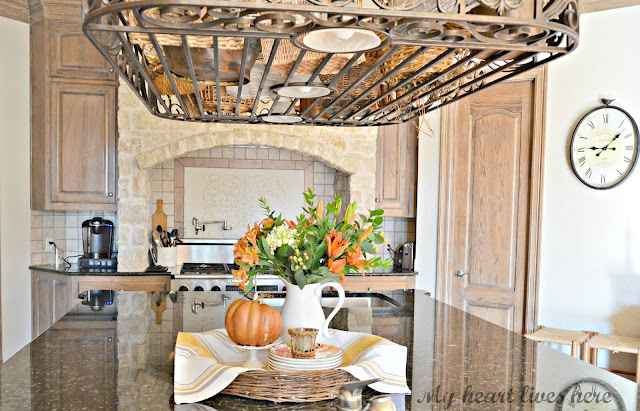 Your kitchen is amazing and the pumpkins add a lovely touch of fall. I so enjoyed the tour Eilis; beautifully done! Your home is fantastic! And you just reminded me that I need to cut a little eucalyptus to add to my fall decor. Eilis, your home is so beautiful! I love all of your Fall touches! Everything feels so warm and inviting! Feel free to come over and redecorate mine! LOL! 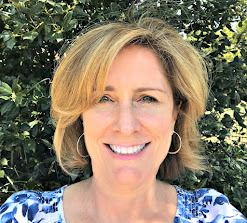 Hi Eilis, just hopping by to let you know that you will be featured at SYC this week. Lovely Eilis!! I really love the dish hutch and the white dishes! I could look at it for a long time and still miss something! The scale with the pumpkin made me smile...great idea! 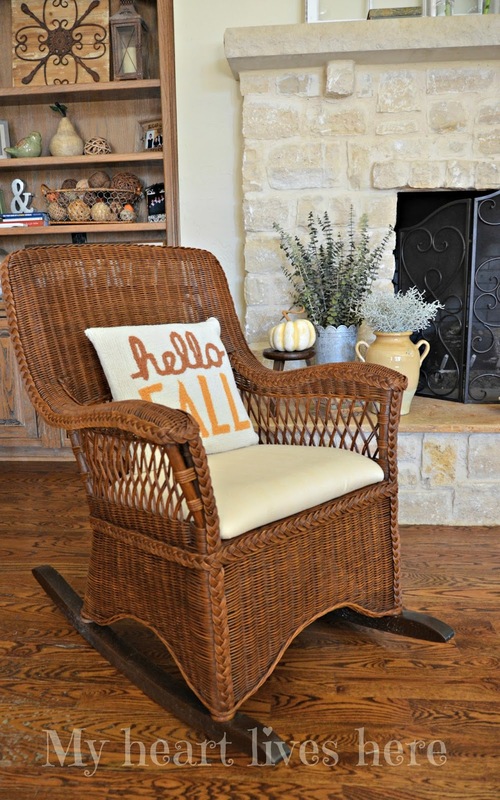 Ellis, Your home is so inviting for fall and I love all of your fall touches. Your hutch is eyecatching with all your ironstone collection, pumpkins and greenery. Those pumpkin plates are adorable and your centerpiece is creative. I want a dough bowl. Don't know what happened to my grandmothers but I wish I had it. Your bar vignette is very striking. I must copy your idea.